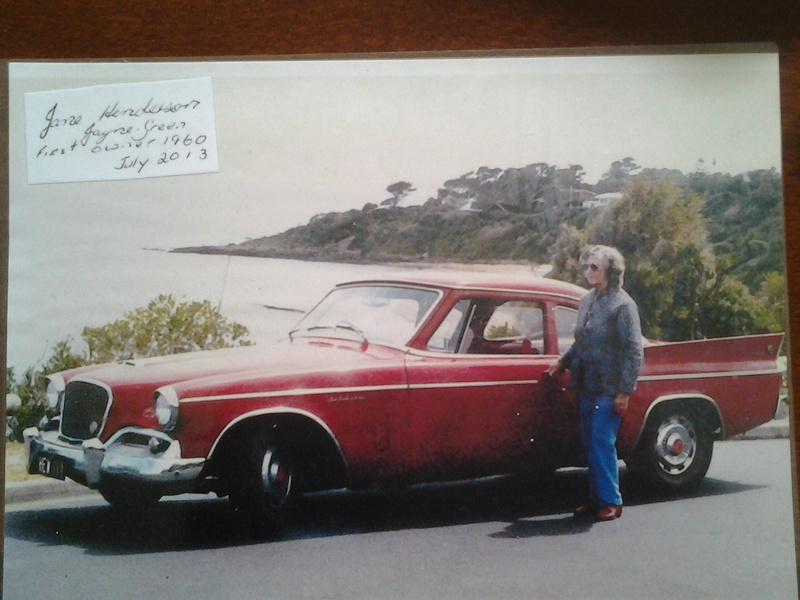 My Studebaker Hawk was first purchased 1960-61 from Mac Chapman in Melbourne by Jean Henderson, her daughter Jayne Green has written a short history of the car, as below. Jean traded her 1948 Jaguar ss3.5 litre on the Studebaker Hawk, the car was used for shopping, picking up children and occasionally on driving holidays to Queensland. She stopped driving the car in the mid Seventies due to ill health and the car was not driven for 5 years or so. Some work was done on the car in the Eighties by Studebaker Club member Mr Alan Hyde to make it driveable, tyres, brakes etc and I used the car to take Jean out from the Nursing home. She remembered the car with affection. After Jean’s death the car was passed onto Dad, Chas Henderson. It had no Roadworthy at this stage and he rarely drove it as there was no power steering. It did however remain fully registered all the time and was garaged at Mt Eliza under cover. After his death the car became mine and I drove it home to Wandong. A road worthy was obtained in 1998- 99 and I have driven it around the district mainly to Kilmore to keep it in working order. It has travelled around 3,000 miles in 15 years and always started first time even when it had been sitting for months. It has been garaged under cover during this period. After seeing some great Studebakers, in my teens in Henderson Street, Bulimba I have always wanted to own one, so after many years I finally found the one advertised in Wandong, Victoria, which had been in the same family since new. 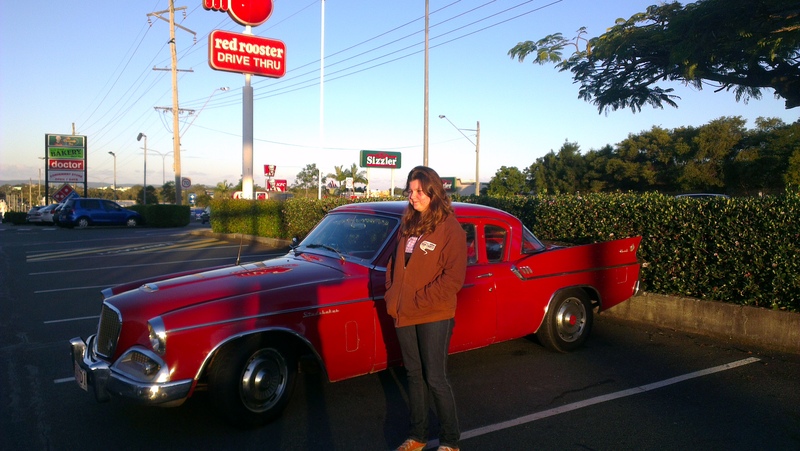 After agreeing to sell me the Studebaker, I flew down to Melbourne to inspect the car and arrange for transport to Queensland. I have rust proofed and redone some upholstery and with the help of Club Members have been maintaining the car. I have done 1,0000 klms since registering the car in 6th month 2013 and just keeps getting better and giving much pleasure. I was born in Brisbane in the year 1931. My parents were Percy and Marguerite (“Daisy” nee Michael) and Perc was a Lands Department clerk. 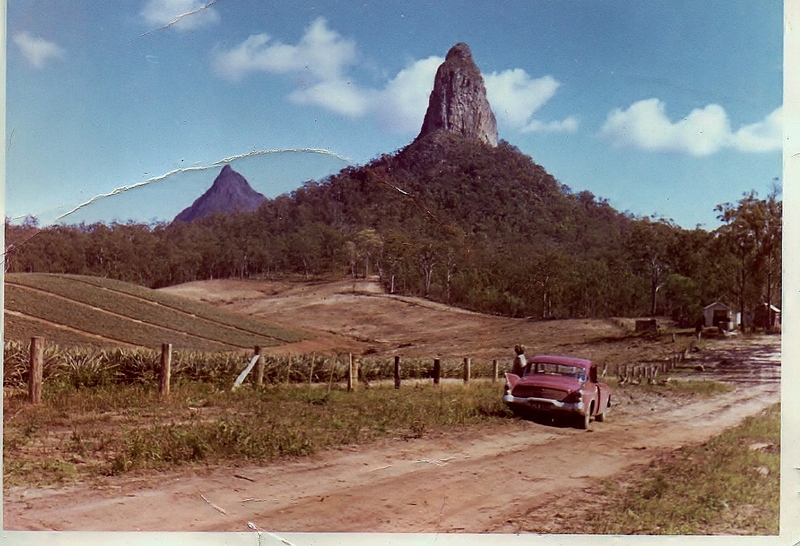 We lived in a “workers dwelling cottage at Ashgrove, then quaintly known as “Napkin Valley”. There was NO CAR! But I had a pumper trike. My primary schooling was split between Oakleigh State at Ashgrove and six months at Stanthorpe where I experienced the orchard community, Dad being there on relief transfer. In 1939 came WW2 and also a pushbike which I had to share day for day with my two years older sister Patricia. My brother Bill didn’t arrive until post-war in 1949. Dad enlisted, having had some reservist training, and was posted as a Lieutenant in the newly raised 2/10th Field Regiment Australian Artillery, to Malaya. It was only just prior to this, that Aust. Artillery had changed from horse drawn to mechanised – those Ford Marmon Herrington 6×6’s. He was lucky to be invalided home 2 weeks before Singapore fell and not, sadly become a P.O.W. He later satisfied his conscience by serving on for 2 years after V.P. day doing P.O.W. (P.W. to him) repatriation work and then War Graves trekking in Borneo. Then of all things back to the office in George Street. But still NO CAR! a difficult year 1950 at Q’ld Uni, bombing soundly out of first year Engineering. Those familiar with the then system will remember we had a requirement (subject) called Vacation Practical. I served this in the engine reconditioning department at Metal Products Pty. Ltd.at Breakfast Creek, and stayed on there for 6 months, learning cylinder boring and various other skills. All hell broke loose in the family when I bought a motor cycle (500 Matchless), but I survived the motor cycles (500 Twin Ariel and 500 Twin Matchie) for three years, and within the family right through. Phew! So when Dad said “outa –there “to my ‘improver’ job as the unions called it then, and found me an apprenticeship with Carters Garage at Gympie, being still under 21, I had to go. That apprenticeship started my association with Ford and with the dairying, beans, pineapples and other farming communities. STILL NO CAR! So during that phase of life bought my own. Living with the family and paying cheap board – UP went my board—-“I’m not paying for your b—– motor car!” After a year or so my loving parents relented and board went down again. This first car was an Austin 8HP rag-hood job. We had a lot of fun in that. About this time, 1952 I joined the CMF (Army Reserve) where I served till 1960, gaining Commissioned rank. In 1954 I landed a contract delivering the ‘Gympie Times’ up the Mary Valley three mornings a week before work with a 4.30am start. Thus I was able to upgrade to a 1948 Hillman and again to a 1953 Ford Consul with these financial thrusts, also becoming a foundation member of Gympie Motor Sporting Club. 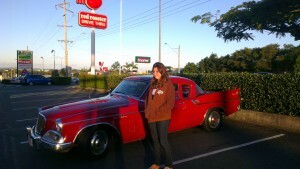 When I finished my apprenticeship in October I followed my heart to Maryborough, working for Ford Dealer Tarrants Pty. Ltd but my heart was sorely misguided ‘cos I got dumped by her, after down-trading to a cheapie 1949 Austin A40, trying to save up. Then a phone call from Dalby, my Dad’s current transfer, “Napier Motors Dalby are looking for mechanics and paying 20% above award”, and yair – that cheap home board again. So off I went. That started me on my love affair with V/8’s and it’s no secret that my average period of ownership of a vehicle while still a single man was only seven months. Dalby was another world as far as garage customer attitudes were concerned. This was a prosperous wheat growing area. In 1956 I met Erna, a girl who didn’t let me down, and after surviving even driving instruction we were married in Toowoomba 20th Sept 1958, my 27th birthday. So no excuse to forget the anniversaries, all 51 of them and counting. We have four offspring – certainly not children – two of each and ten grandchildren, all living within an hour of where we are. 1959 found me grinding crankshafts at Dalby Engine Rebuilders. I apparently had a knack for this. But in 1960 I was sweet-talked out of that by Napiers to go and manage their Ford Sub Dealership at Tara. Housing constraints saw me out of there and off with the family to Brisbane. We have lived at the same house at Sherwood ever since. Drifting out of mechanical – I wasn’t all that keen – I spent the greater part of my working life driving trucks and buses, either on my own account or for other employers, including Stradbroke Ferries and Barnes Auto from whom I went into Tilt –Trays on my own account. My first Studebaker I inherited from my maternal grandfather in 1961. A 1936 Dictator 6 Swallowtail. Sold it back to my aunt for Red Book value 55 quid thinking I’ll get it again, but she traded it in and when I rushed to get it, it was already sold. Never mind there have been 6 Studies since but never more than 2 at one time. Ramblers also have had their say, all seven of them and the best all-round family car I would reckon to be the 1964 Rambler American 6. Since 1977 there was usually a run-about boat in the picture too and in 1998 it advanced to a trailer-sailer, a 23 ft. Norwalk Islands Sharpie, which my sons commandeered to race competitively. That was not my thing and it was sold in 2005. All this has been current with a fairly active church life for which I am grateful to Erna to have introduced me to the Lutheran Christian faith on top of the Anglican grounding from my grandparents. It would not be wise for me to list all the vehicles I’ve had. There were 49 of them plus those I’ve forgotten, ranging from those mentioned above to an Ansair Flxible Clipper Coach which in 1972 nearly sent me broke. My latest acquisition is a Suzuki APV Van, because I’m being environmentally conscious and trying to use the ‘Smallest vehicle that will do the job.” And I love the way it does the job with front engine, rear wheel drive and wind-up windows. Studebaker fan Dave Lucas, and the hardtop Lark he brought back to life. While the world’s car makers still scramble to top each other’s version of the electric car, the company that started life in Indiana in 1852 making wagons for farmers, miners and the military, began making electric cars in 1902. Dave Lucas, the proud owner of two fine Studebakers, says the company should have kept making them. “Studebakers are good-quality cars that were a long way ahead of their time,” Lucas says. Studebaker moved to petrol cars in 1912 and the last model rolled off their Canadian assembly line in 1966. Lucas points out that in 1946 they introduced a hill-holder function (“just put on the brake and then release it and it wouldn’t roll back on a hill”) and in 1952 they launched a three-speed automatic transmission with manual overdrive in every gear. “And they won just about every economy run in the ’50s and ’60s,” he says. Lucas, 67, manager of Caboolture Motorcycles, owns a 1960 Studebaker hard-top Lark, which he bought in 2002 for $5000 from a Victorian. “It had more rust than the Cherry Venture,” he says, comparing it to the infamous Sunshine Coast shipwreck that was removed from its Teewah Beach resting place in 2007 because it had decomposed so much it was considered too dangerous. Lucas claims the person he bought it from had a pink slip that showed the vehicle had once been owned by American actor Tim Conway, who played the not-so-bright Ensign Parker on the old black-and-white TV comedy McHale’s Navy. “When the guy told me I said, ‘You couldn’t have told me it was Clark Gable or Humphrey Bogart, could you?’,” he says. “I’ve had no luck contacting him (Conway). He’s still alive. I wanted to get a photo of him with the car. Lucas bought the car because he liked the shape. “I persevered with it. Worked on it for three years, nearly always at night because I work six days a week. “It kept me in the shed at night, which probably made my wife happy. Anyway, it’s been well worth the effort. It’s a great little car. Lucas claims it is the only one of its type in Queensland and one of about three in Australia. the industrial designer responsible for the Coke bottle and Lucky Strike cigarette packet. Lucas’s first car was a 1934 Dodge Tourer he bought for £50 when he was 14 and living in Manly, Sydney. “I used to drive it to school and I don’t know how I never got arrested,” he says. “You could do those sorts of things in those days. “On Friday and Saturday nights we went down to the Manly Corsa in our (Ford) Customlines and used to park and beat the girls away with a stick. Lucas also boasts that he is a Ford man. “I have owned just about every Ford that was built from 1932 to 1955,” he says. He moved to Queensland in the 1970s as a sales manager at Yamaha and raced off-road bikes, later opening a motorcycle retail business. “I got to that stage in my life where I was getting bored so one day I was looking at a car mag and thought I’d love to restore an old car,” he says. “It’s good fun going to all the shows and reminiscing with people my own age. “People think we’re just silly old buggers, but we’re not really; we’re just enjoying life. Lucas will be enjoying life with his old mates when he shows his Lark at the annual 2009 Studebaker Concours on August 30 from 9am to 3pm at South Bank.